It is always a delight to see a new sheet from Max Decals and this one is a real treat in more ways than one. First off, the sheet covers a selection of aircraft that was undoubtedly spurred on by the availability of some new and reissued kits. The initial offering is a Vampire T.55 for the new Airfix kit. This one is in high speed silver with daglo bits. 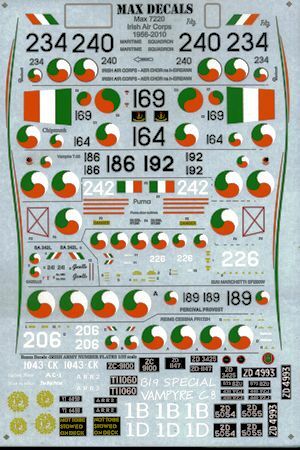 Two different serial numbers are offered and like the other offerings, one will need to use the kit decals for common data markings, which isn't a problem as new Airfix decals are quite good. Next are a pair of King Air 200s. For this, the RVHP or Mach 2 kits will be required, though those with the old Rareplanes vacuform kit will also have a kit that can be used. There are two markings options for this plane. O ne is with the international orange bands as worn in 1980, while the other has a more civilian like scheme from 2009. The Chimpmunk is also offered with two markings options, both on overall silver planes with black nose anti-glare panels. One is as delivered with with the two color insignia and broad stripes under the wing while the other is later with daglo or international orange markings and a badge on the nose. You'll need the Planet Models kit to do the SF.260 Warrior. This one is in overall dark green, a color close to FS 14079. In the same color is a Reims Cessna FR-172. For this, the Arii kit of the Cessna 172 would be your best choice. 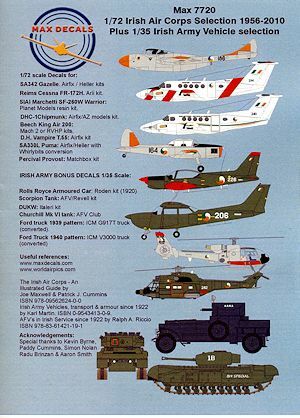 Not shown on the cover art, there is a set of markings for the Percival Provost, for which the Matchbox kit is the recommended kit. Moving to rotary wings we have a Gazelle in a light grey that will work well with the Airfix kit. The Puma is also one that will need the Airfix kit along with some upgrade parts. Those are listed for those wishing to do this conversion. Now for the additional stuff and those are plates and markings for some Irish Army stuff in 1/35 scale. There are markings for four different Rolls Royce armored cars that has been kitted. Next are a pair of Churchill Mk VIs from 1949 and a Scorpion from 1985, the latter having two alternate markings. A rather interesting DUKW is also provided from 1949 when it was used for coastline mapping. Two Ford trucks, one a 1939 and another a 1940 pattern are the final installments in what is really a very nice sheet. It is nice to see such a varied collection of subjects on one sheet and this is one that I know you will find worth getting. I'd tell you that these tend to sell out rather quickly, but you probably already know that. Review sheet courtesy of Max Decals. Please visit them at www.maxdecals.com.